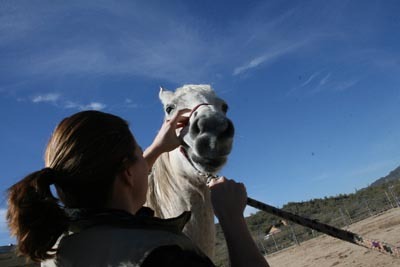 Stacey Sickler is the veterinarian who's been taking care of the strangles horses here. I arranged to tag along with her Friday on her rounds. I am to meet her at Santolina Farm at 9:30 AM. I get a call from her assistant at 9:20, saying Stacey's running a bit late but will meet me there. 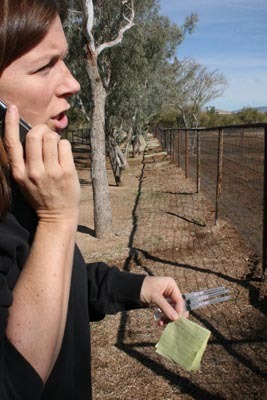 9:35: Stacy arrives at Lomita Farm, a nice Breeding and Therapy Rehabilitation Center tucked away near Cave Creek. 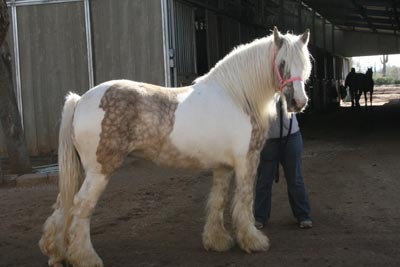 They breed Arabians, National Show Horses, and Quarter Horses, and have just added some beautiful Gypsy Vanners to their program. At the farm Stacy chats with the owners; chats with a groom, who knows which horse needs which vaccinations; palpates 3 mares; gives rounds of WEE/VEE/Tetanus vaccines. Always in one hand is her cell phone and the other hand is her recorder, to efficiently keep track of what she's done with each horse, (early on in the morning, the recorder ran out of battery power and said, "C U" and switched off). The other hand holds the vaccines. 10:58 AM: Leave Santolina and drive to pick up Stacy's assistant Carol on the way to next call. 11:33 AM: Arrive at Hilde's place. 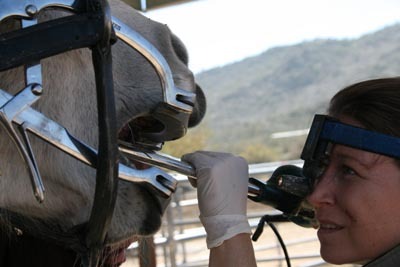 She's got 2 trail horses; 1 gets vaccines, 1 gets vaccines and gets her teeth floated. 12:16: leave Hilde's; drive to next call. It's a fancy stable in an 'upscale neighborhood' - tucked back in a beautifully landscaped area (read: native plants left alone and encouraged to grow, narrow dirt roads), to give one horse a Legend shot. Talk to another owner who drives in. 1:15 PM: leave; have some time before her next appt, so actually go to eat Radical Pitas. 1:57 PM: on to next call, at a boarding farm. 2:28 PM: arrive, meet with owner, implant microchip in neck on Thoroughbred, back to Santolina farm to drop me off, day over at 3:00. I've planned to watch Stacey play in a polo match (!) tomorrow, and ride with her again on vet rounds on Monday.